Guest Author: Stuart Cooke from Uni Baggage. 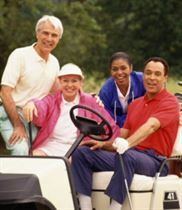 If you are a keen golfer, then you will have probably toyed with the idea of taking a golf trip with your pals at some stage. Golf trips offer the perfect combination of a fun vacation and challenging yourself on a new course in a different environment. There are a lot of things to consider however when it comes to planning a golf trip but don’t worry, we’re here to help. Here are 5 tips that should help take the stress out of organizing your next golf trip. You will want to choose the time of your trip carefully and the best times will vary depending on where you are planning on visiting. If you are travelling to the UK or Ireland for example, then you will get the best weather between May and September. Of course, the weather is notoriously changeable in this part of the world but if you are looking for an authentic links experience then a bit of rain and wind might actually enhance your experience. As you would expect if you book during the summer months then course prices will be higher than in the spring or autumn so if you aim for a late spring/early autumn trip then you should hopefully get the best blend of good weather and lower prices. Taking a trip to one of the best golf courses in the world may seem like a great idea and I know the pros make Augusta National look like it can be tamed but choosing a course that is beyond your golfing standards is a recipe for a nightmare trip. Yes, it’s great to challenge yourself on good courses but you need to match the groups ability with the course so that you can actually enjoy the experience and not spend the entire time fishing your ball out of the water or feeling exhausted after 5 holes. If you lower the standard of the course a little to suit your skill levels, then you will actually enjoy posting competitive scores and competing against one another. There are 2 parts to this, firstly you will want to ensure that everyone in your group of friends will get along with one another. Just like any vacation, you will be spending a lot of time travelling and staying in close quarters together and when you throw in the inevitable competitiveness that will occur on a golf trip then tensions can easily arise. That’s why it’s important to have a group who know each other well, the last thing you want is a rift forming mid-way through the trip. It’s also important to take the golfing ability of each member of the group and to try and keep a similar level throughout. The last thing you want is for one or 2 low handicap golfers getting frustrated and held up by the rest of the group who are there more for the social side of things. If everyone is at a similar level, then you can all enjoy the course the same and the friendly competition will be much better. If you take your golf seriously then you will most probably want to take your own clubs with you, after all you spent enough on them, so you might as well put them to good use! This can be tricky though if you are travelling overseas. Do you bring them with you on the plane and if so how much extra will that cost you? These are questions that you will want to ask your airline or alternatively there are luggage delivery services that will actually pick up your clubs at your home and ship them ahead to your hotel, often for less than the airlines excess baggage charges. Obviously, you want a trip that is heavily focused on playing golf, but what about the rest of the time? Will you want to spend time sunbathing on a beach, or perhaps sightseeing in a nearby city? The type of trip you are looking for will depend on the preferences of your group but it’s a good idea to try and cater for everyone’s tastes. One option is to stay at a golf resort. As the name suggests they are tailored specifically for golf trips so your accommodation will be close to the course and you will be able to rent clubs, gears, buggies etc. easily from the resort, even included as part of your package. You can play golf during the day and then stay in the resort at night where your meals and entertainment will all be provided within the same resort. This is the ideal choice for the more serious golfers who want to play as much as possible during the day and relax at night. The second option is to stay at a hotel close the course but still independent so that you can do other things if and when you want. If your group is looking for a fun trip with some golf thrown in then this is probably the choice for you. You can see some sights, visit different restaurants and bars each night and generally enjoy the vacation experience as much as possible. Author Bio: Stuart Cooke is from Uni Baggage. As a luggage delivery service, they have helped lots of golfers to send their clubs ahead to their destination taking the stress out of their golf trip. What To Pack For a Five Day Golf Vacation?